After having worked hard for two months on Mom’s new apartment, we were blessed this week to experience a getaway trip. Art was really tired, as he said in his last post. So we decided that we’d take a week off, since we needed to go to IKEA in Atlanta anyway, to get a sofa-bed for Mom. I must tell you, though, that the week got off to a rough start. Let me tell you how not to stealth camp in Atlanta! We decided to go to IKEA the first day, to make sure that the items we needed were available (we planned to go back and buy them on our last day, on our way out of town), and that visit went just fine. But when we left the store around 6:30 pm and started looking for a park where we could make our supper, our urban adventure began. We had heard that the area around IKEA (Atlantic Station) was a really nice part of town, and that Piedmont Park had lots to offer, so we headed over in that direction. When we got to the park, we were surprised to see that one must pay up to $15 a day for the privilege of enjoying the park, and that the only parking available was in a multi-level garage. Fortunately, we were able to turn around and come back out of the garage without paying, and begin looking for a smaller, more picnic-friendly place. Unfortunately, even if you search under Parks/Gardens, the GPS doesn’t always take you where you are wanting to go. The first “park” it found turned out to be a very nice neighborhood, which we enjoyed driving through, but there was no public park. The second try took us to a government housing project. But the third time was indeed a charm, and once we stopped to ask a nearby resident exactly where the entrance was, we were pleasantly surprised to find a lovely small neighborhood facility with a place to park just steps away from the tables. If you’re in Atlanta and want to picnic on the east side, try Candler Park. Unfortunately, the pool was closing just as we arrived and that meant no access to the restrooms. Fortunately, we carry our own “rest room” with us! Candler Park is also a pleasant neighborhood of century-old bungalows and similar homes. Later, I looked up the area on zillow.com and saw that some of those cute little houses are selling for around $500K! Anyway, we set up the stove and cooked our supper without incident. After supper we looked for a Lowe’s so that we could check our email. Fortunately, there was one nearby in an area called Edgewood Retail District. It looked like a little town center, but was all commercial space, like a mall. The Lowe’s was open until 10 pm (this being a large city, after all), so we had time to finish our work and we headed out to find a Walmart at around 10 pm. Take note—there are no 24-hour Walmarts in Atlanta inside the beltway, at least not that we could find. Because we were closest to I-20, we decided to just keep going east until we found a store that looked like it would be safe for the night. After stopping to check out stores at several exits, we finally found one in Conyers, GA and laid our heads on our pillows at exactly midnight. Whew! Don’t try to stealth camp inside the beltway! We probably spent enough money on gas getting out to Conyers and then back up through Atlanta to the northwest suburbs, to have rented a modest hotel room! In the morning, we did find a city park in Conyers, called Pine Log Park, where we had breakfast. Note to campers: it had the luxury of a family rest room with electricity, which is like gold for a stealth camper. Family rest rooms offer the luxury of privacy, and can be used to fill water jugs, take a sponge bath or even wash hair, and if there is an outlet, you can use a hair dryer or curling iron. In retrospect, we probably could have parked for the night in town, if we had thought about using a neighborhood street, church parking lot, or a well-lighted commercial space next to a highway. Staying at Walmart, however, has the advantage of 24-hour security, which is also important, especially in a city setting. After breakfast, having decided that we had had enough urban experience for a while, we consulted the maps and chose to head up toward the northwest suburbs to Allatoona Lake, which will be the subject of my next post. 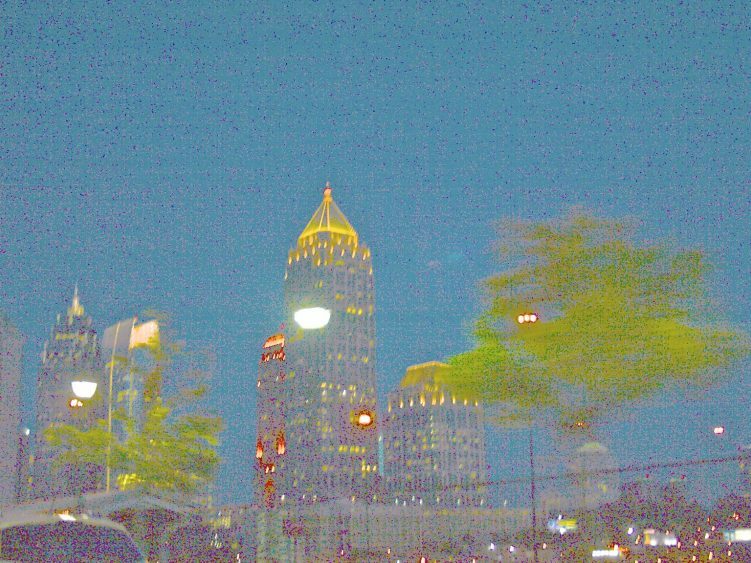 Perhaps we can explore Atlanta another time . . .